Cyrsti's Condo: Cyrsti's Condo "Fashion Break"
What girl doesn't love her shoes, genetic, cross dresser or transgender? 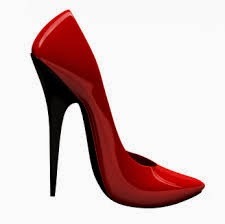 We are committed to bringing our customers fashionable, feminine-styled footwear in a large shoe size. Our high-quality, affordable footwear is designed to specifically to meet the needs of customers who wear a women’s size 10 ½ to 17 (wide) or a men’s size 9 to 15 (medium) in the latest styles. With reinforced heels for added stability and cushioned insoles for added comfort, Le Dame Footwear is crafted to accommodate the length and width of the larger foot. Our unique designs allow our customers to purchase a true large size that is both fashionable and sturdy, eliminating the need to choose between style and fit and giving you a product that you’re proud to wear. Le Dame Footwear is headquartered near Madison Wisconsin. Plus they have a few stores around the U.S. and the world. Check out their on line site here.